LLANELLI, Wales (AP) — Scotland captain John Barclay will not play rugby until at least the end of the year after surgery on a ruptured left Achilles tendon. 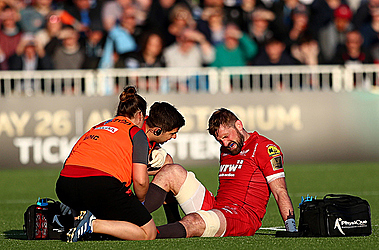 Barclay was hurt on Friday while playing for Scarlets, just minutes into the Pro14 semifinals. He had the operation on Monday, Scarlets said on Tuesday. The injury brought an end to Barclay's five-year stint at Scarlets, and he will miss the Pro14 final this weekend. He was already rested from Scotland's tour next month of Canada, the United States, and Argentina, and the injury made the flanker a doubt for tests in November against Wales, Fiji, South Africa, and Argentina. Barclay has 71 caps for Scotland, to where Scarlets made arrangements for him to recover and rehabilitate with his new club Edinburgh.